Skcin are very proud and excited to announce that we have been invited to attend Professional Beauty London, the UK’s largest beauty and spa trade show, to speak about the launch of our ground-breaking campaign, MASCED (Melanoma and Skin Cancer Early Detection) a free, national, educational accreditation programme for hair, health and beauty industry professionals. 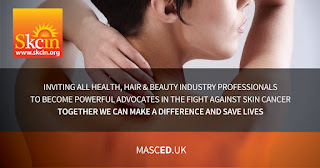 We are delighted that Professional Beauty recognise that melanoma and skin cancer awareness and prevention is vitally important and that early detection is a lifesaving area of training for beauty industry professionals. This event will be the perfect arena to raise awareness of the unique training we offer to our target audience with this dedicated educational intervention initiative. It literally can save lives. Around 86% of melanoma are caused by over exposure to UV, killing around 7 people per day in the UK. Prevention and education are key to stopping this terrible disease in its tracks and early detection vital to improve prognosis and save lives. If you are a professional working in the hair, health or beauty industry sector, Skcin would love to meet you and work with you and your business to help save lives through early detection - demonstrating first class customer care to your clients. A huge thank you to all of you who have already registered. We have been overwhelmed with the support and interest already received as we look forward to launching the programme later this month. Happy New Year to all our fabulous supporters and future accredited professionals!